LONDON (Reuters) - Scottish marine salvage group Ardent is adapting the tanksit used to refloat the Costa Concordia, the cruise ship wrecked off the Italian coast in 2012, to decommission North Sea oil platforms. It is one of several companies trying new ideas to win business in the market for dismantling disused oil platforms. In Britain's ageing oil fields alone, the opportunities could be worth up to 17 billion pounds ($21.85 billion) before 2025, according to industry body Oil and Gas UK. The ideas could then be deployed to other maturing fields such as in the Gulf of Mexico and southeast Asia. "Everyone is queuing to be second," said Ardent's Decommissioning Director Stuart Martin. Oil companies are keen to reduce costs in a part of the market dominated by major global players such as TechnipFMC, Schlumberger, Saipem and AllSeas. Beyond the floating tanks, Ardent has also joined forces with oil services firm WorleyParsons and technology and shipping group Lloyd's Register, to bring a one-stop-shop service. "You got to give Well-Safe and the others a real tip of the hat. We all want them to win. It's in the best interest of the industry," said Jim House, CEO of Neptune Energy, which is planning decommissioning for its Juliet and Minke fields in the North Sea. "This technology could have significant potential cost efficiencies," the Oil and Gas Technology Centre, which is funded by the British government, said in a report. But Ardent says it would need contracts for at least two buoyant tanks to go below current costs per tonne of steel removed and three to get below its target cost reduction of around a third. Britain's industry regulator, the Oil and Gas Authority, has set a target of 35 percent cost cuts compared with 2015 levels. Well-Safe's main lever for cost reduction also depends on several operators committing to contracts. "It's a lot about an emerging set of companies and we don't yet know which is going to be the winning model," said Boston Consulting Group’s Philip Whittaker. "One of the biggest sources of value is how to integrate the decom work with the final stages of the production work." With other fields maturing and drying up across the worldand some experts expecting demand for oil to peak in the 2030s,the North Sea is a test bed for new decommissioning projects. 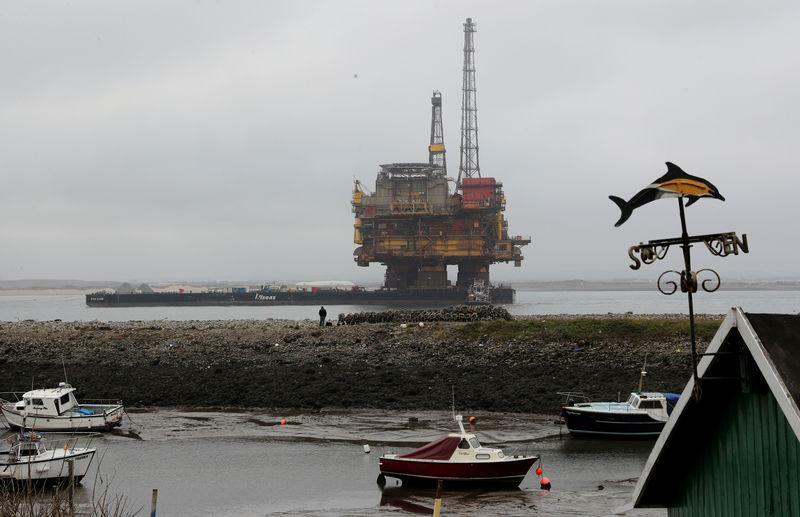 If a company can plug oil wells without leaks and removethousands of tonnes of steel platforms and pipelines, some 50years old, in the rough, deep seas between Scotland, England andNorway, they should be able to do it anywhere. Industry body Oil and Gas UK, expects oil companies to spend 17 billion pounds ($22.05 billion) on removing around 1,600wells, 100 platforms, and 5,500 km of pipelines in the nextseven years. Some 840,000 tonnes of material will be returned toshore to meet environmental regulations. "We've got a mature basin with a steady flow of work," saidJoe Laesk, decommissioning manager at Oil and Gas UK. "Those resources and expertise can be exportable globally." The Gulf of Mexico has had decommissioning projects in its warm, calm waters for years but Southeast Asia is a new hot spot, with more than 1,500 platforms and 7,000 subsea wells expected to be uneconomical by 2038, according to the BCG. That is followed by Latin America, West Africa and the Middle East Gulf. Service vessel group Allseas is experimenting with new ideas. It specialises in subsea construction but is converting huge ships to lift structures as heavy as 48,000 tonnes in one haul. "We lift in a matter of hours and we're gone," said AllseasPresident Edward Heerema. The first job for Allseas' Pioneering Spirit, the biggestconstruction vessel in the world, was in the Norwegian North Searemoving Repsol's 13,500 tonne Yme production unit. Shell also used it to remove its 24,000 tonneBrent Delta platform in 2017. "We have taken substantial costs out of our major decommissioning project, the Brent, and we will continue to do so," said Steve Phimister, head of Shell's North Sea upstream. "The whole industry needs to do that by innovating."